I'm back from CHA and my head is still reeling with tons of ideas. Well, really - when is it not? I got this fun "phoomph" stuff to play with from Coats and Clark and knew exactly what I wanted to do with it first. 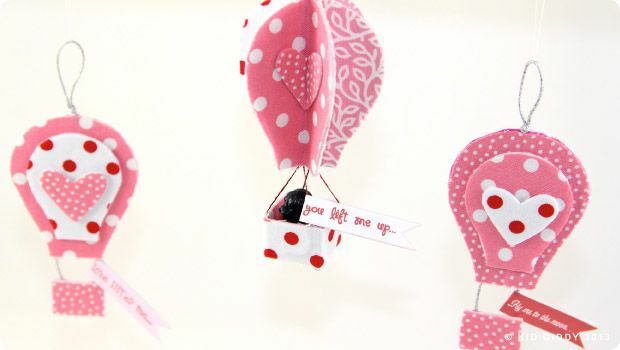 If you still need an idea for a valentine or two...take their breathe away with these cute, no sew Hot Air Balloons! 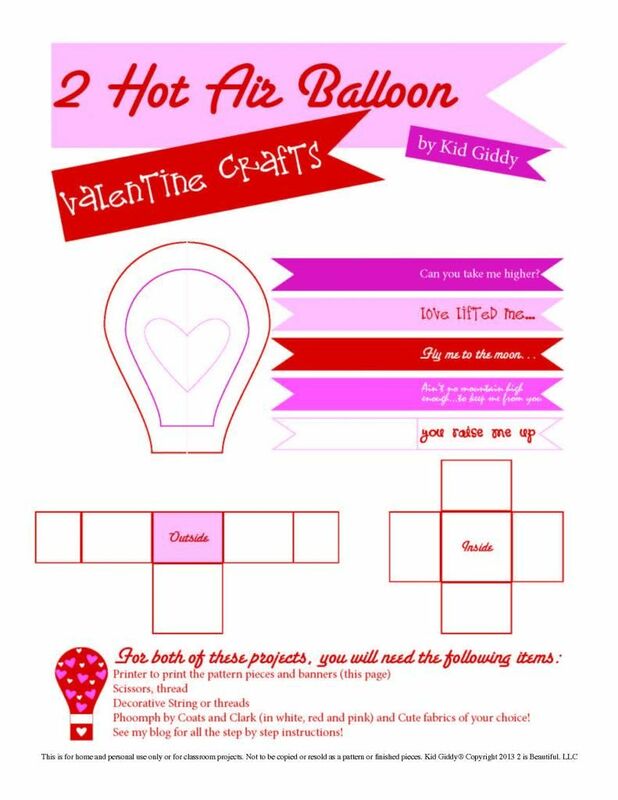 You can make the simple version (great for kids) or if you get carried away, you can make the 3D version. Either way, they will both be cute and the talk of the town! I prefer to use the stiff Phoomph material for this project, and used my Westcott No-Stick Titanium scissors! You'll need to print this out. I preferred to use card stock so the little banners are sturdy, but it's up to you. 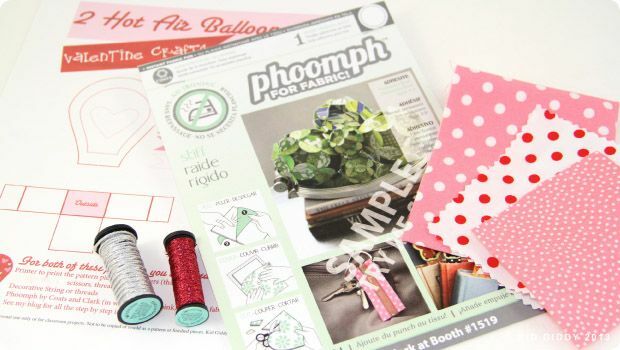 Most often when using Phoomph, you can peel off the paper liner, place the fabric and then cut. 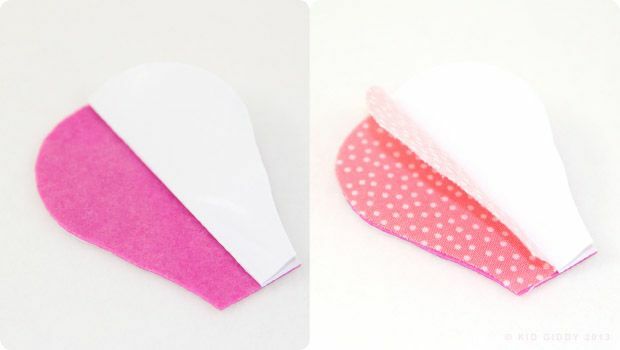 However, when making these, you will need to cut out the shapes first, peel the paper liner, place the decorative thread down the center of the balloon, and then the fabric shape on top. Leave about a 3/4" gap of thread and then place the ends on the basket piece. Place as many layers on top of each other as you'd like. 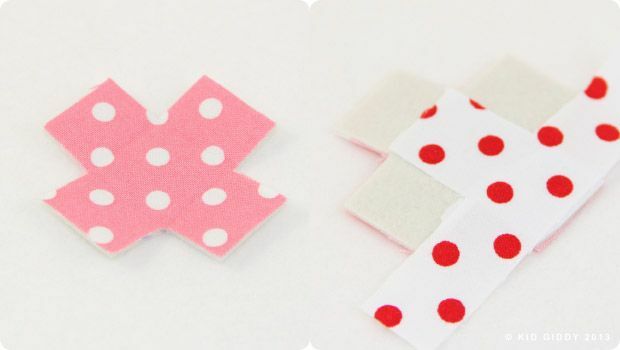 Use a little scrap piece of phoomph to attach the message banner to the thread. Phoomph comes in white, black, and many different colors and soft or stiff. 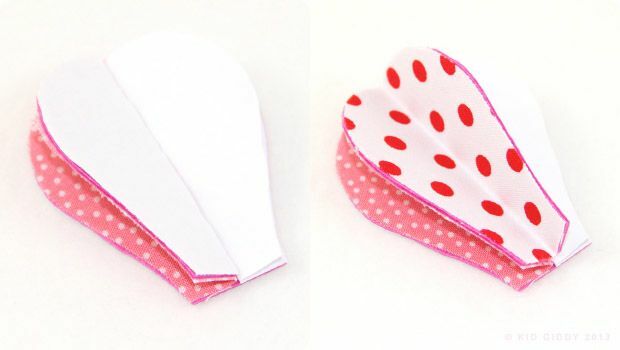 I have used the stiff for stability, and used pink for these so you can clearly see everything on the white background. 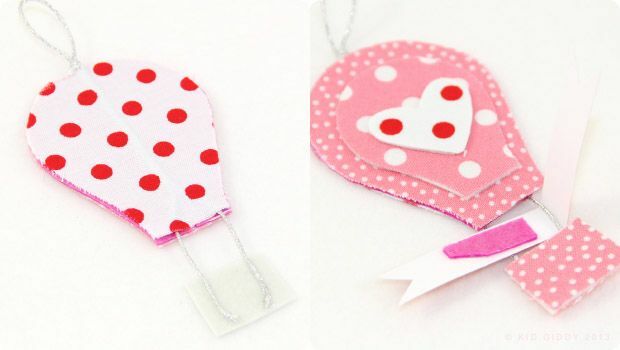 Fold over the paper liner on your first large hot air balloon piece. Place half of the fabric and fold the other half on top of itself. Take a half piece of the large hot air balloon, and lay that on top of the back of the first fabric piece. Take off the paper liner from that half, and lay the next fabric piece on top. Repeat this step with another half piece of the Large hot air balloon piece, so there are 2 halves. You can use a whole piece, but the phoomph doesn't keep a fold or crease easily because it's stiff. So cutting it in half, helps do what it needs to do. To make the basket, cut out the inside piece first (with phoomph and fabric already attached on one side is easiest). Flip the basket piece over and take off all of the paper liner except one side so it doesn't stick to the fabric in this step. Place the square onto the center of the basket. 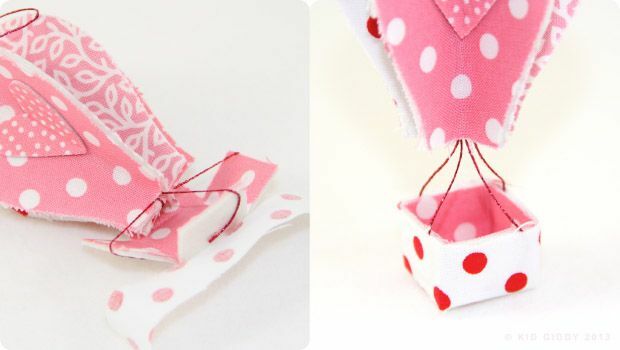 Attach each thread end to the outer sides of the basket (evenly so the basket isn't crooked), and then hold the sides up and wrap the fabric around the outside of the basket until they meet in the back. This will hold the sides together. Attach a message banner to one of the threads the same way as done above. Thanks so much for stopping by. Feel free to share this by pinning/sharing one of the finished pics above. Please do not pin the entire tutorial or any of the tutorial pics. 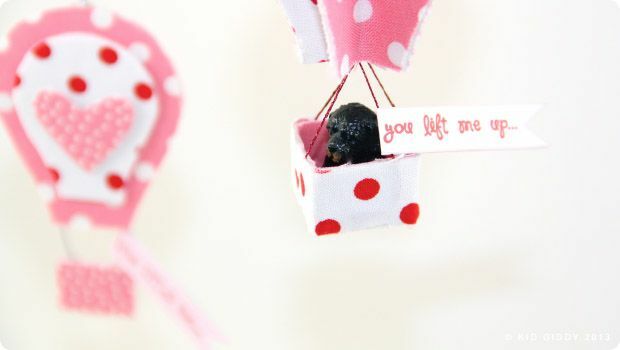 Although I was given free Phoomph from Coats and Clark, and decorative Kreinik thread product, the opinions set forth in this post, are my own. 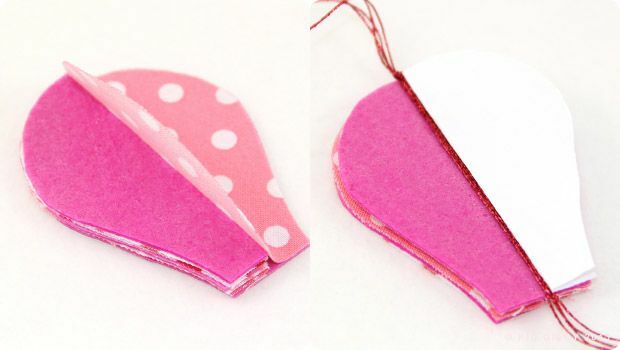 This tutorial is shared with you in the hopes that you will learn a new fun craft. Please do not use my tutorials for your own gain. Please do not use my photos without permission and please do not retake any photos to remake the tutorial for your own blog or another company. These photos and the text are copyright protected. If you'd like to "Pin" one of the photos, please credit me by using "#kidgiddy". Thank you for your cooperation.